David Daballen. 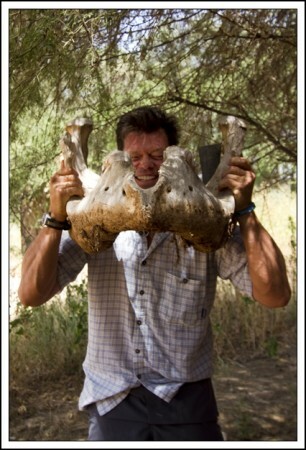 Photo courtesy of Save the Elephants. I should have mentioned that joining us for lunch yesterday was David Daballen, the chief field researcher for Save the Elephants. I know a bit about David. 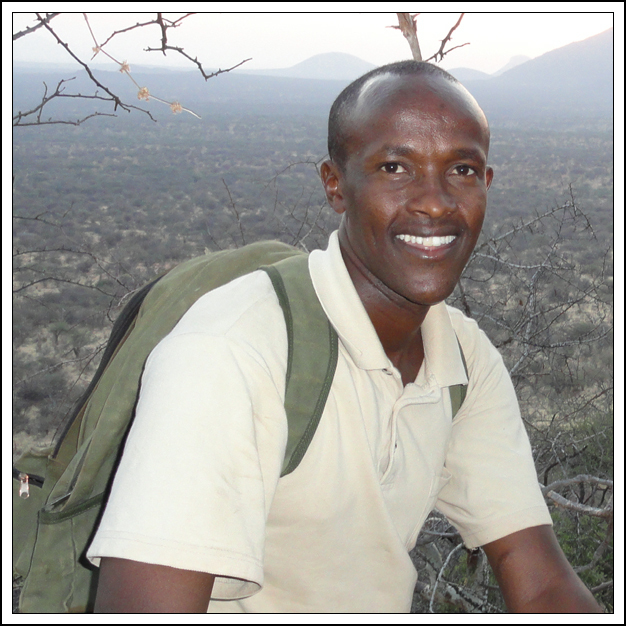 He’s a Kenyan who grew up near Lake Paradise on Mount Marsabit and last year he and seven other crazy individuals walked from Marsabit across the Kaisut Desert to the Mathews Range following a nomadic bull elephant named Shadrack. Actually, not all of the eight men walked across the Kaisut Desert; some gave up and had to be evacuated. But David Daballen, along with his brother Teteya, completed the trek. David knew that Shadrack was a streaker because two years ago, they’d put a GPS collar around his neck and monitored the big bull elephant leaving Mount Marsabit in May and heading south, across the Kaisut Desert, traversing the same inhospitable stretch of lava fields, dry riverbeds, and thick bush we’d just covered from Lake Paradise before eventually reaching the elephant-friendly Ngeng, a river valley in the Mathews Range. He’d covered 129 miles in five days. What David Daballen and the other researchers at STE wanted to know was: How did he navigate his way to the Mathews Range? Was he following some unknown and ancient elephant pathway? How close had he come to people? And they figured the best way to get those answers was to walk behind Shadrack. For as long as it took. Anyway, I mention all this because David was sitting down at the far end of the table during the somewhat heated discussion between me and Iain and a couple of times I looked down at his end of the table and tried to get him involved in the conversation, curious to know what a Kenyan who grew up near Lake Paradise thought about some of these issues on animal conservation, but each time I did, I’d see him look nervously at his mentor and then defer to him. I think he was afraid to speak up in front of Iain. Which was a shame. I really would have liked to hear what he thought about all this. It’s the day after Thanksgiving and all of us, particularly me, are too stuffed to do anything other than sit back on the couch and watch a football game. 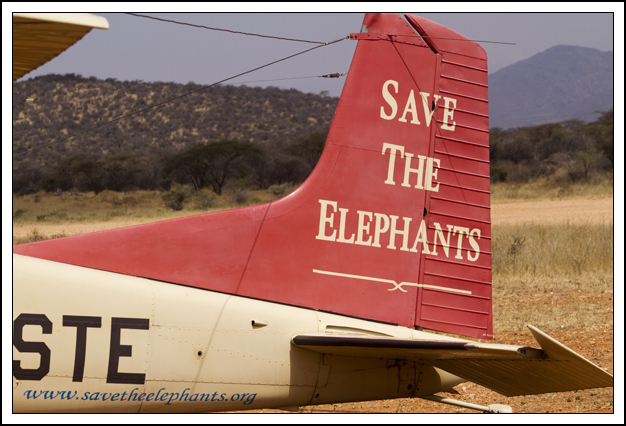 Or, in my case, watch a family of elephants not far from the appropriately named Elephant Watch Camp here in Samburu. So rather than me going on and on about what we saw and what the guide, Simeon, was like etc., etc., here’s a very brief video that you can watch on your laptop while burping away on the couch. How do you say turkey in Swahili? As far as I know there are no words for “Happy Thanksgiving” in Swahili. Or for turkey, for that matter. But they do have some lovely guinea fowl here and Pedro was so hungry today that…well, you can see from this photo how he just ate this beast right down to the bone. Happy Thanksgiving to all of my readers! The Douglas-Hamilton's plane at the Samburu airstrip. Photo by David Lansing. So we drop Hardy and Fletch off at the airstrip and then head back to camp, thinking we might do a little game-viewing along the way, but it’s midday and, sensibly enough, all the animals are taking a nap in the bundu so there’s really not much to see. After a 15-minute drive we’re just about back to Elephant Watch Camp when our Samburu driver notices a plane coming in low over the camp. It’s Iain and Oria arriving. Now the sensible thing to do, since we’re only a few minutes away from camp and have already made two trips back and forth to the airstrip, would be to drop us off and go back and pick up the Douglas-Hamiltons, but obviously Iain or perhaps Oria has put the fear of god in their Samburu staff and although our driver apologizes prolifically, he announces that he must turn the vehicle around and head back to the airstrip because the Douglas-Hamiltons do not like to be kept waiting when they fly in from Lake Naivasha where Oria has a farm (and a private game sanctuary called Olerai House). He jerks the car around and we fly out to the airport, going twice as fast as we’d gone originally to take Hardy and Fletch out there, bouncing over the potted dirt road, dust flying everywhere, a panicked look on the Samburu’s face. When we arrive at the airstrip, Iain and Oria are standing there, bags at their side, waiting. I should mention at this point that Pete is old friends with the Douglas-Hamiltons. His parents have helped sponsor Save the Elephants and Pete is practically a godson to Iain and Oria (which, really, is why we’re here). In addition to that, Iain and Oria have two beautiful daughters, Saba and Dudu, one (at least) of whom Pete was enamored enough of that he proposed to her (we won’t say which one). Saba, by the way, is Swahili for “seven” and was so named because she was born on June 7, 1970 at 7 o’clock under the sign of Scorpio (you can see that, in a slightly different locale, Iain and Oria would have ended up either running an incense shop in San Francisco or traveling in a VW bus around the country following the Grateful Dead—or both). Dudu was born Mara Moon but was nicknamed Dudu because, her mom says, “she was such a little buzzing bee when she was small.” Dudu, by the way, is Swahili for insect. So hugs and kisses are exchanged between Pete and his faux-godparents and eventually we get back in the car and, for the third time today, leave the airstrip for Elephant Watch Camp, this time with Iain driving. Which is not necessarily a good thing. Even though he’s almost 70 these days, he’s still a bit of a Mad Max and Oria, from the back seat, tells him several times to slow down or watch out for the potholes or, on one occasion, to try not to impale all of us by driving right through the overhanging branches of a thorny acacia tree. I guess living in the bush for as long as the Douglas-Hamiltons have, they’ve both developed their own survival techniques. It will be interesting to see if I develop some as well. 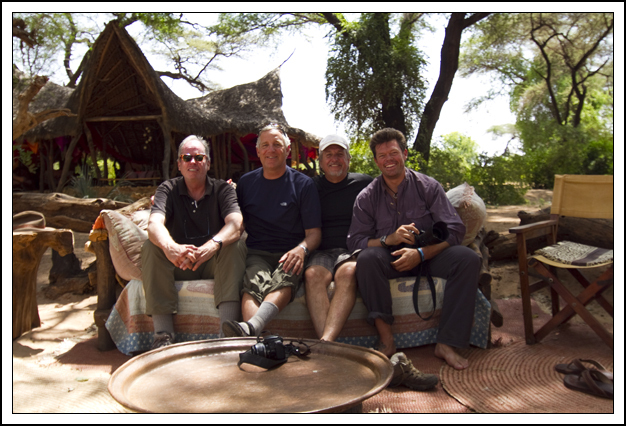 Our last group photo at Elephant Watch Camp; me, Hardy, Fletcher, and Pedro, left to right. Well, this is a bit embarrassing. When we landed at the Samburu airstrip there was nobody there to pick us up so the pilot checked his phone and saw that he had a text message from Tropic Air saying we were to land at the other Samburu airstrip. The only problem was that they’d sent the text message about 20 minutes after we took off from Marsabit so he hadn’t gotten it. No biggie. We just piled back in the little Cessna and rolled down the bumpy dirt runway, got in the air for all of about five minutes, and then landed again at the correct field. On the flight from Marsabit Hardy talked the pilot into hanging out at Elephant Watch Camp for a couple of hours instead of flying straight on to Nairobi, so all four of us as well as the pilot jumped in to the safari vehicle that was waiting for us and being driven by a couple of Samburu, one with braided hair colored with ochre mud. Along the way we had to stop for a few minutes as a cow and her calf were pulling limbs off some trees while standing in the road and obviously didn’t want to be interrupted. Eventually they moved on and so did we. The camp itself, located on the sand banks of the Ewaso Nyiro River, is quite beautiful in a rustic sort of way, being built out of wood scavenged from fallen trees and mud walls and thatched roofs. It’s hard to believe that pretty much the entire camp was washed away in floods earlier this year and has been completely rebuilt by Oria and her staff. A Samburu moran serves us tea at Elephant Watch Camp. Photo by David Lansing. Iain and Oria weren’t here when we arrived but we were told they’d be here soon and we’d all have lunch together, and perhaps while we waited we’d like to have tea. We sat in a sort of outdoor living room area down by the river. There were woven mats on the sandy ground and a comfortable couch and tables made from driftwood beneath lacy acacia trees filled with vervet monkeys. The black-faced vervet is certainly more genial than the baboons we’d been used to at Lake Paradise, although like the baboon he can be rather dastardly and you have to watch out they don’t pee on you or worse. 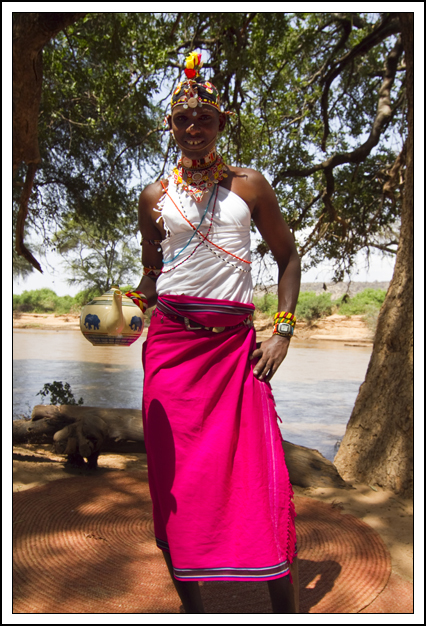 We ordered tea which was brought out to us by a Samburu moran dressed up in a flamingo pink shuka and tons of beaded jewelry. He poured us a cup and we sat there in a languid state listening to the starlings and the monkeys in the trees and the gentle sound of the river floating by. We kept hoping that Oria and Iain would show up so we could have lunch and Hardy and Fletch could meet them before they had to get back to the airstrip, but it wasn’t to be. So we gathered ourselves up and sat on the couch for a final group shot and then Hardy and Fletch and the pilot got back in the safari rig and we all said our goodbyes and even though Pete and I will be staying on here at the Elephant Watch Camp, it felt like our expedition to Lake Paradise and our journey was truly over. And not wanting it to end just yet, Pete and I decided to go back to the airstrip with Hardy and Fletch and watch them fly away. Which, sadly, we did.